If you are planning on going fishing, it is important to make sure that you have a good trolling motor battery. A trolling motor is attached to your kayak at either the bow or the stern and helps your boat to “troll” along the waters at varying speeds. 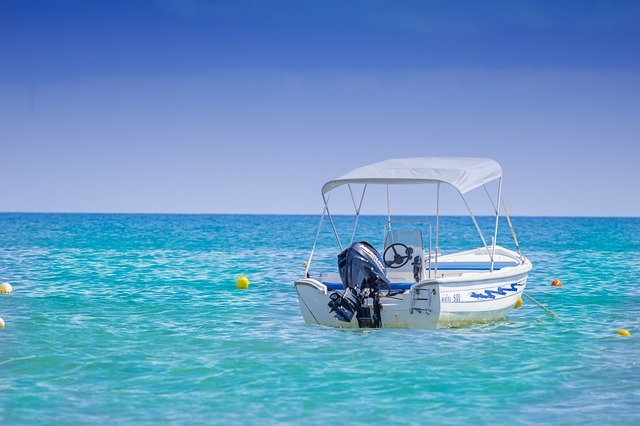 These motors generally contain batteries and, unless you want your boat or kayak to stop in the middle of the lake, you are going to want to make sure that you have a good motor battery. That is where we come in! We have compiled the following guidelines and lists to help you find the perfect battery for you, so you can peacefully fish, without worrying about whether or not your motor is going to stop working. Can I use the battery for other purposes? Are they also deep cycle battery? Can I use it for my portable hum radio? Can I use other battery charger? Will it harm the battery? Can I use these in my 1998 holiday rambler endeavor? It is dual SAE & 5/16" stainless steel stud posts. 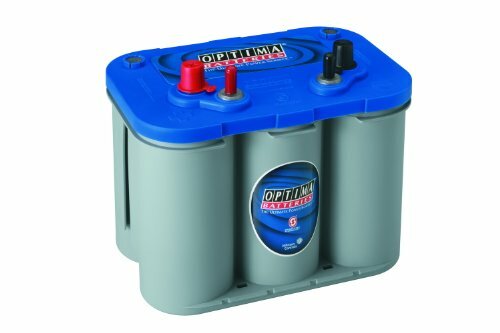 Optima 8006-006 34M Blue Top is a 12 Volt, 800 amp trolling motor battery. It weighs around 38.4 pounds, is approximately 10” wide by 8” tall and has 5/16” stainless steel studs. It is said to be 15 times more resistant to vibrations than other batteries, making it very durable. This battery is easy to start, even in bad weather, and has a reserve capacity of 100 minutes, which means that it will run at top voltage for 100 minutes before lowering the voltage. It can be charged with most 12 Volt DC battery chargers, making it easy to use. However, many customers have said that it holds a charge very well, and will not need to be charged very often. This particular model can only be used for starting the motor and should not be used for cycling the motor. Good performance in bad weather. It's spiralcell technology makes superior vibration resistance. This trolling motor battery weighs 53.8 pounds, is 12.2 inches wide and 8.7 inches tall and is made with spiral cell technology that uses the purest form of lead and adds vibration resistance and durability. The cells are very tightly compressed, which further adds to the battery’s vibration resistance and makes it even more durable. 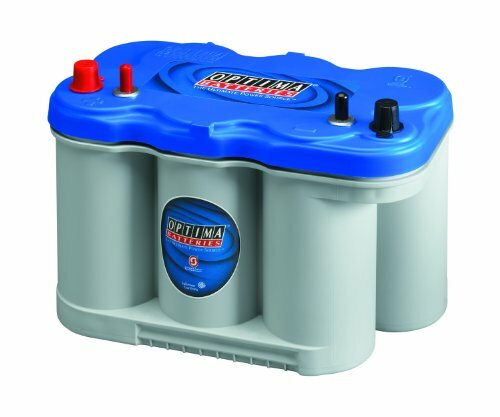 Optima Batteries 8027-127 D27M BlueTop battery is completely spill-proof, meaning that you do not need to worry about battery acid leaking or spilling onto the floor of your boat. Due to the fact that the cells are tightly sealed, you are able to place this battery in virtually any position without any worries about spillage or damage. It is a dual purpose battery, meaning that it can be used for both starting and cycling the motor. It has a very high reserve capacity of 140 minutes and is a 12 volt, 800-amp battery. This battery is great for those who tournament fish, as it lasts quite a while and has a high reserve capacity. This battery is also fairly easy to install and tends to ship quickly. This particular trolling motor battery weighs in at just around 50 pounds and is 10.2 by 8.7 inches. It is a 12 volt, 775-amp battery. It holds a charge well, though you should make sure and charge it when it is not in use. 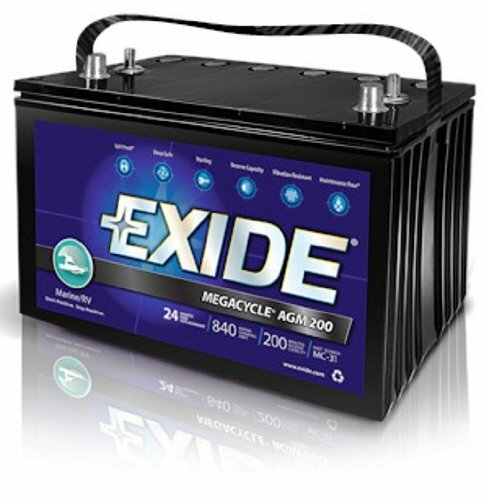 Exide Edge FP-AGM24DP Flat Plate AGM is a dual use battery and works great for deep cycling. It is a sealed battery, which makes it spill proof. This is great because it means that you won’t ever have to worry about this battery causing damage to your vehicle. This Exide battery is very durable and long-lasting. It has a reserve capacity of 145 minutes, allowing you to get a good amount of usage per charge. It's heavy duty lead tin alloys provide an extra margin of performance. This battery is extremely long lasting and durable, and is sure to last you between 8 and 10 years. It is a 12 Volt battery that is about 10 by 8 inches and weighs around 60 pounds. The Vmaxtanks MR107 12V 85AH Marine AGM has an electrolyte suspension system that guarantees to completely absorb and store the electrolyte, meaning it is spill proof. This battery also does not have any silica gel or other contaminants or toxins, making it a very safe and non-hazardous battery. There is no need for adding water or checking the gravity of the electrolyte on this battery, so you have no need to worry about maintenance. It is very shock and vibration resistant and runs for 7 more hours per charge. 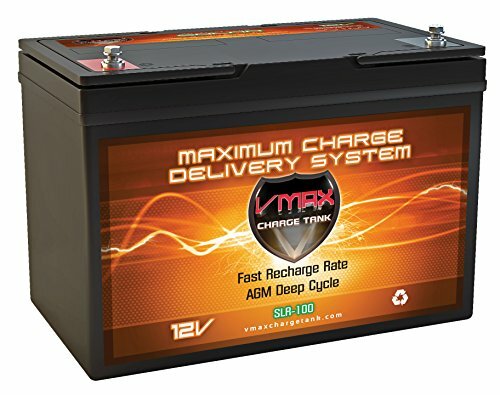 It is recommended that you purchase a VMAX charger for this battery to ensure that it charges quickly and efficiently. It has gotten very positive customer reviews and comes very highly recommended. This item 3-Sealed Non Spill able Non Hazardous Construction. This battery is also from VMAX and is fairly similar to the one mentioned above. It contains no silica gel or other contaminants and is not at all hazardous. The VMAXMB127 AGM Deep Cycle Group 27 is made with an electrolyte suspension system that ensures that all the electrolyte is absorbed and properly contained, preventing possible spillage of battery acid. This battery is both shock and vibration resistant, making it very durable and great for fisherman who may fish in rougher waters. VMAX batteries are very well known and loved for their extensive lifespan and can last up to 10 years. This battery is also maintenance free, meaning less stress for you. The battery can last up to 12 hours per charge when used on low speed and charged with a VMAX charger. This battery weighs around 60 pounds and is about 12 by 8 inches. The battery provide maintenance free operation. Another VMAX battery, this particular model is a bit smaller than the previously mentioned VMAX batteries. It is about 7 by 6 inches and weighs just around 25 pounds. Made with lead tin alloy, this battery has an extended lifespan and added durability. The VMAXTANKS Vmax857 Tm AGM is also maintenance free and there is no need to check gravity of the electrolyte or add water to this battery during its lifespan. The battery lasts about 8 hours per charge, and it is recommended that you charge it using a VMAX charger for added lifespan and proper charging. The battery is shock and vibration resistant, which adds to the durability of this product. It is also made to properly absorb and contain all of the electrolyte and contains no contaminants, so it is safe and not hazardous at all. This bttery SLA/AGM maintenance free & spill proof. This battery is quite a bit smaller than other batteries and is only 7.68 inches x 5.16 inches x 7.13 inches, though it can fit in most battery boxes by using some packing around the battery itself. The 12V 35AH Wilderness Tarpon 100 Kayak battery is spill proof and utilizes AGM technology to insure that all the electrolyte is absorbed and contained properly. It has a long lifespan and is very durable. It is made from a heavy duty calcium alloy, which adds durability and years on the lifespan. The battery does not come with a charger, but can charged using almost any 12 Volt battery charger (you choice these smart chargers), and can last for over 3 hours per charge. How fast it takes to charge is dependent upon the charger that you buy, but it does tend to charge fairly quickly. Less Battery life than others. This item Weight (lbs): 23.1lbs. Interstate Batteries Sealed Lead Acid (AGM) - DCM0035﻿﻿﻿ is also fairly small and is a Group U1 battery. It weighs around 24 pounds and is 7.7 by 6.3 inches. It can be used on air, surface or water, making it very versatile. It has a pretty good warranty, as long as you have your proof of purchase, and they will often send you a check for the price of a replacement if anything happens to the battery while it is under warranty. It is a 12 Volt battery and though it does not come with a charger, you can charge it using any 12 Volt battery charger, such as the one that you might use to charge your car battery. Although it is small, people have found that this battery lasts quite a while per charge, with some people reporting that they used it for over 4 ½ hours and still had 60% charge left on the battery. Made Dual SAE & 5/16 inches Stainless Steel Stud Posts. This 12 Volt, 750 Amp battery is approximately 10 by 8 inches and weighs just over 43 pounds. It has 5/6” stainless steel posts and is 15 times more durable and resistant to vibrations than other similar batteries. It is very easy to start and has plenty of starting power, even when the weather is bad. The spiral cell technology that Optima uses in all its batteries makes the battery very long lasting and durable. 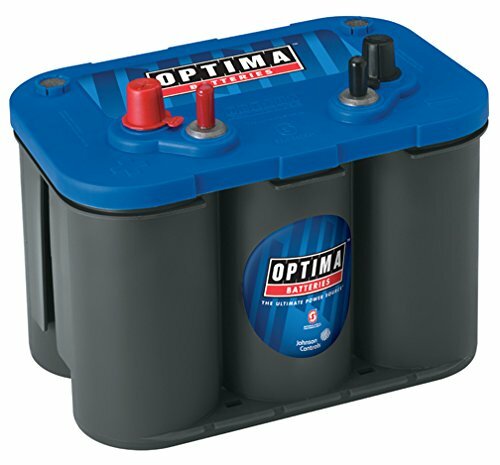 The Optima 8016-103 D34M BlueTop is a dual use top rated battery, making it great for starting or cycling the motor. It comes in very sturdy, protective packaging so you can rest assured that your battery will get to you safe and sound. Since this battery is a sealed battery, it can be placed to charge or run at any angle and in any position, making it great for everybody and very versatile. Used to dual terminal design. This battery has a fantastic reserve capacity of 200 minutes, making it great for those who like to run at high speeds for a long time. Exide XMC-31 MEGACYCLE AGM-200 utilizes an absorbed glass mat, which ensures that the battery is spill proof and prevents the cell from drying out. This also gives it more durability during bumpy rides, high vibration or deep cycling. Exide has a great warranty that covers the battery for a full 24 months from the time of purchase. It is 13 by 8 inches and weighs around 74 pounds, making it bigger than some of the other batteries we looked at. However, the larger size does allow for the longer reserve capacity and allows for the battery to run longer per charge than other, similar batteries. This is 12v 55Ah trolling motor battery perfect fitting for small to medium boats (especially Pontoon Boat). Who Love to compete with boats at high speeds or plan to travel long on the waterway undoubtedly it's fit for them. This battery made by heavy duty calcium-alloy grid to keep better performance in float or cyclic applications. It can redact well under low-temperature conditions. So it lasts longer than other batteries. Once charged, you can use 4 hours, also full speed. You can use more than 6 hours when you run at a low speed. This sealed lead acid battery spill-proof and highly resistant to vibrations and shock. It is built through AGM technology. it's including high discharge rate, deep discharge recover, long service life, and wide operating temperatures. In any position, you can mount this battery. It's offered the money back guarantee and 1years warranty. It can redact well under low-temperature conditions. Can't use for the big boat. 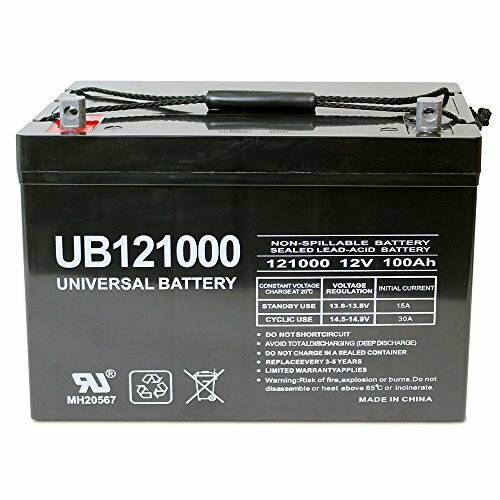 The universal power group 12V 100Ah battery is a good battery for trolling motor and electric storage. It gives suitable strength with a long-term use compared to a dual purpose battery. It is very effective thanks to integrated AGM technology, which enables the battery to save less than three percent of the total charge per month. Don't need to add water or any other maintenance because of this technology. storage capacity 100Ah that's a good point to choose this battery. Battery body built to tolerate normal weather conditions & protect from the leak. It can stave shocks and vibrations that make it a good and safe buy. tolerate normal weather conditions & protect from the leak. This is one of the top brands in the trolling motor battery business. This business began way back in 1934 in the town of Fargo, North Dakota by the inventor of the trolling motor: Mr. O. G. Schmidt. With such a long history, Minn Kota is a company that you know you can trust. This company is highly committed to improving the fishing and motor trolling business through new innovations and ideas and they have had many of “firsts” in this business. Minn Kota sells Trolling Motors for both fresh and salt water, shallow water anchors, on board and portable battery charges and a variety of accessories including apparel, anchor winches, trolling motor accessories, talon accessories, charger and battery accessories. Their trolling motors have been used by fisherman for over 80 years and their name is very well known. They use the newest, most cutting-edge innovations to create extremely tough, durable and long-lasting trolling motors, best trolling motor battery and accessories. Another very well-known brand, Vmax Tanks is a fantastic brand for trolling motor batteries. Their specialty is batteries and they deliver batteries that are high performance, high quality and heavy duty. Their deep cycling capabilities are unmatched by any other company in the business and their batteries require the least of maintenance of any batteries in the business. 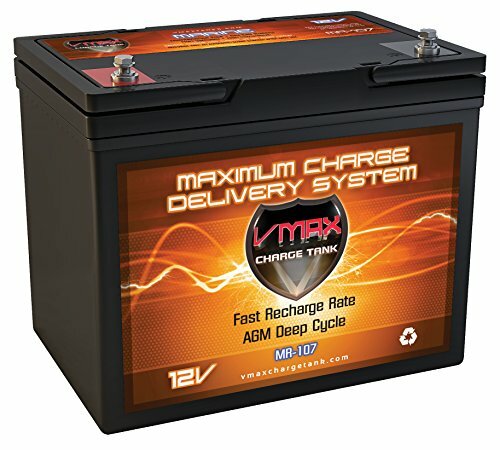 While other companies tend to sell starting batteries that occasionally have deep cycling capabilities, Vmax creates deep cycling batteries that also have starting capabilities. This gives their batteries versatility and makes the company stand out as one of the best. They also sell batteries that run on solar or alternative energies, making them good for the environment and safe. 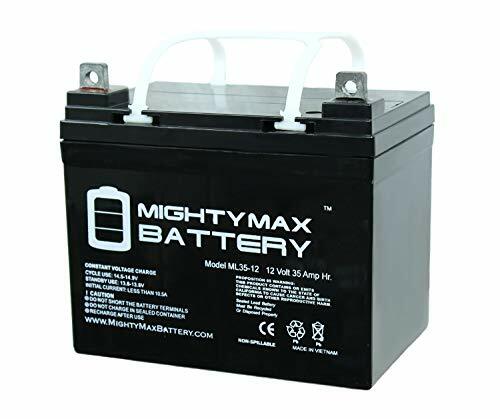 Their batteries are used in military grade equipment, electric vehicles, and industrial strength machinery, so you can be assured that a battery from this company will provide maximum performance. Vmax Tanks is the perfect solution for anyone needing a battery for Marine, RV or other tough applications. Optima is another amazing brand that creates and sells trolling motor batteries. They are the only company with Spiralcell Technology ®, making their batteries different than all the other batteries in the world. These batteries have an extremely clean power source that also delivers super strong power. Their batteries last longer than many other batteries in the business, making them a great choice for anyone wishes to buy a battery for prolonged use. Optima’s batteries are all vibration resistant and spill proof, so you will never have to worry about damage to the battery or to your vehicle. Each battery type they sell has a different color top, making it easy to find which battery you need and to replace any old batteries. They create batteries for modern vehicles, trucks, SUVs, street cars, RVS and of course, boats with trolling motors. Optima is definitely one of the best battery brands out there, and their batteries are sure to satisfy. When buying the perfect trolling motor battery, there are a number of things that you need to take into account. We have found the most important things to consider when buying your trolling motor battery, and will discuss why each one is important below. This one is a no-brainier: you obviously need to take into account the price tag of the battery you are wanting to purchase, as well as your budget. If you know that your budget is under $200, you will want to make sure that you aren’t looking at any batteries that cost more than that. On the flip side, if you find a really amazing price, you may want to check and make sure that the dealer or brand is reputable with good reviews. Another good tip for pricing is to check different sellers to find the best price available. There are a multitude of different brands selling trolling motor batteries, and they can all seem pretty similar. However, you definitely want to make sure that you are buying a battery that comes from a good, well-known brand. The brands we mentioned earlier in this article (Vmax Tanks, Optima and Minn Kota) are always good options, though there are other high quality, reputable brands out there as well. Always look for a brand that has good customer reviews and has a good warranty that fully covers your battery for at least a year. When buying a battery, you want to make sure that you are buying one that is going to last you a long time. What use is a battery that only lasts 6 months? Companies often makes claims about how long their batteries last, and about how durable they are, but their warranties don’t always back up these claims. Customer reviews are often a good way to tell how long a battery lasts, and if a company covers their product under the warranty for a long time you can be assured that it will last a long time. This is something that, while highly important, is often overlooked. Batteries can be badly damaged or even ruined by intense vibrations. Fishing boats often travel over choppy or rough waters, and the trolling motor battery is generally subjected to a lot of vibration. Some batteries are more vibration resistant than others, and you should always try to buy a battery that falls into this category. If you have a bigger boat you might not care about the weight of your trolling motor battery. However, smaller boats can be weighed down by the heavy weight of a trolling motor battery, and if your boat is small you may want to look for a battery that weighs under 40 pounds. Also, every trolling motor is going to require a specific size of battery and so you should make sure to find out what size you need before shopping around. If you are planning on taking longer fishing trips, or if you plan on fishing every day, you are going to want a battery that can go for a long time per charge. Nobody wants to be forced to take a day off of fishing because their trolling motor battery isn’t charged! The best source for finding out how long a battery truly lasts is customer reviews. Customers will often report exactly how long they used the battery for and how much charge was left at the end of their trip. Look for a battery that lasts at least 4 hours, though preferably the battery will last around 8 hours. Yes, you can. Most of the batteries are made for dual purposes. Most batteries have terminal for both automotive and RV/ marine use. So, you can use it for your boat or your car. But a cheaper battery also serves as well for a car. Besides these, you can use it for extra power source in emergency moment. Yes, though they are known as marine battery mostly, but they are also known as deep cycle battery. But remember that the marine battery and the deep cycle battery (here is a good list of deep cycle types) are different types. Basically they are different but they work like same. So sometimes they can be called as deep cycle battery. ​No, the sucker of the battery is too heavy, it will damage the radio. So, it’s better idea not to use it for a portable hum radio. ​Yes, you can use other charger. But it’s recommended to use the included charger. You may use your boat’s built in charger. It generally does not harm the battery but sometimes you may face problems. ​Why not? If the CCA are same and it fits in the space then I do not see any reason that you can’t use it. When you start your trolling motor with the battery, listen carefully the sound. If you hear any unexpected sound or cracking, then it’s time to look after your battery. It is weakening. If you use lead acid battery then check the water level of the battery regularly. Use distilled water and skip using tap water, or the battery acid that is found to purchase at local automotive stores. Do not forget to wear eye protection when you change the acid. When you leave your battery idle, keep the tackle charge ongoing. It helps to prevent the battery damage. Always try to charge your battery regularly. Do not charge whenever you want. Continuous charging helps to keep the battery performance. Do not overcharge your battery. Do not charge the battery with high or low voltage. When it gets dust, clean it properly. Optima batteries are always a great choice, which is part of the reason we chose this battery. Optima Batteries 8016-103 D34M battery is 15 times more durable and resistant to vibrations than other similar batteries for sale. Being so resistant to vibrations makes this battery great for anyone who enjoys fishing on rough or choppy lakes or rivers, or for fishermen who fish on the ocean. This Optima battery is also able to start quickly and easily, even in bad weather, which adds to the high quality of this battery. This feature also makes it great for those who fish during the winter, on the ocean or during rainy weather. It has a good reserve capacity of 120 minutes, so you are able to have continuous power during your fishing trip. Many customers have said that this battery charges very quickly, making it great for fishermen who like to fish every day. This battery has the Optima exclusive Spiralcell Technology, making it totally spill proof, and it is a sealed battery. Both of these features make this battery able to be installed in almost any position. This battery is very durable and versatile and is a great purchase for any fisherman. One of the best things about Vmax batteries is that they are essentially maintenance free, meaning you will never have to worry about checking gravity or adding water. This gives you more time to fish and less time to worry about your battery. 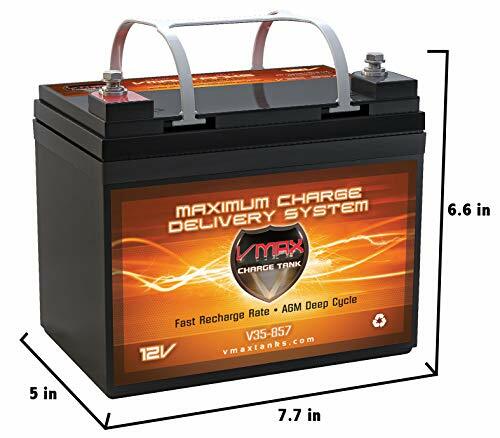 Part of the reason we chose VMAXTANKS Vmax857 battery is because it weighs only 25 pounds and is small enough to fit in virtually any trolling motor or battery box. It is made from heavy duty lead tin alloy and contains absolutely no silica gel or other contaminants, which makes it totally non-hazardous and very safe. This battery is created to safely absorb and contain all of the electrolyte, which further adds to the safety of this battery. This battery can last over 8 hours per charge, and works best when it is charged using a Vmax charger. This battery lasts a long time, with multiple customers stating that they’ve been using the same battery for multiple years without any noticeable difference in performance. 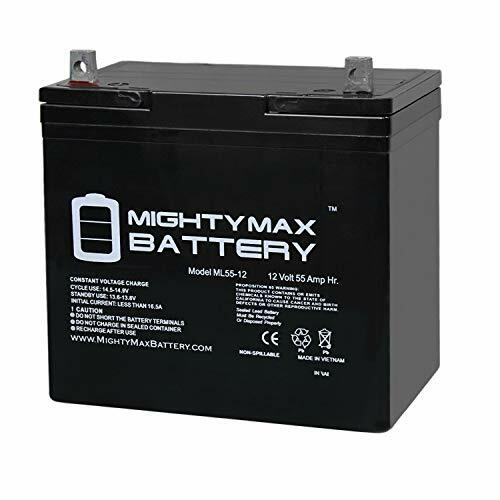 If you are looking for a durable and long last battery that is safe and non-hazardous, you should consider buying this battery from Vmax. 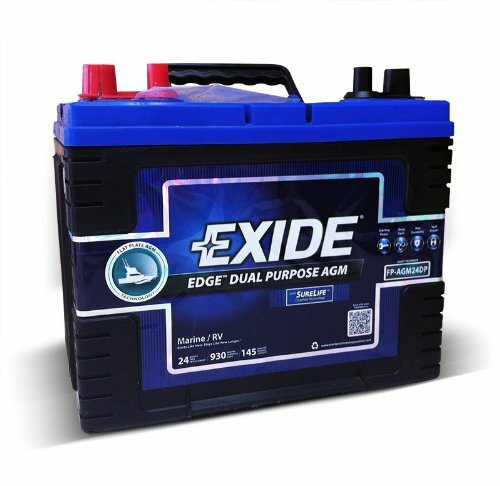 Exide Edge FP-AGM24DP battery was chosen partly because it has the highest reserve capacity of any battery on our list, with 145 solid minutes, allowing you to get a great amount of usage per charge. The higher the reserve capacity is, the more time you will be able to use your battery at the highest voltage, making this battery great for those who enjoy long fishing trips or who like to quickly move from one fishing hole to the next. It is also known to hold charge well, though it is suggested that you leave the battery on a trickle charge while not in use to ensure it remains fully charged. This battery is created with amazing AGM technology, making it totally spill proof, which means no more worrying about leaking battery acid ruining your boat or other vehicle. This battery is dual purpose, allowing you to use it for both starting and cycling your trolling motor. It weighs around 50 pounds and fits very easily into most boats and trolling motors. This battery is also very versatile and durable and can be charged using any 12 Volt charger. 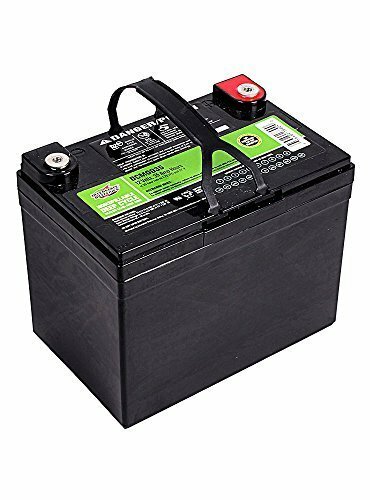 Interstate Batteries Sealed Lead Acid - DCM0035 battery is another small battery, weighing only 24 pounds and measuring 7.7 by 6.3 inches, which is part of the reason we chose this battery. It is light enough to easily transport between boats if you desire, and is small enough to fit in even the smallest battery compartments and trolling motors. The light weight won’t weigh your boat down, so this is a good option for those who have smaller fishing boats. It is very versatile and can be sued on air, surface or water and can be charged using any 12 Volt battery charger, though it does not come with a charger. The warranty is amazing on this battery and multiple customers report that they received a check in the mail for the price of a replacement when their battery had issues while still under warranty. It can be used on air, surface or water, making it very versatile. Despite its smaller size, this battery lasts quite a while per charge. In fact, many customers have reported that it still had over 60% of its charge after being used on a 4 ½ hour fishing trip. This battery is a great purchase for anyone with a smaller boat who is looking for a long lasting and durable battery. We chose Optima Batteries 8027-127 D27M battery for a variety of reasons, including its versatility and durability. Although this battery is a bit larger than some of the other batteries on the list, weighing around 53 pounds, it is one of the best trolling motor battery for tournament fishers, or even fishers who just tend to take longer than average fishing trips! It is easy to install and can fit into any Group 27 trolling motor, making it perfect for any boat with a trolling motor. It is versatile, can be used for both starting and deep cycling, meaning that you won’t ever need to worry about purchasing more than one battery. It can also be installed in almost any position, making it great for those who smaller or oddly shaped boats. We picked this battery partly because of its amazing reserve capacity, which allows the motor to run at full voltage for 140 minutes at a time! This is a wonderful option for those who plan on travelling on a large lake or river. Trolling motor batteries come in a variety of different sizes and they all have different features. Find the battery that fits in your trolling motor and fits your needs best. Also remember to shop around to find the best price available and always read customer reviews! Most importantly, have fun fishing!